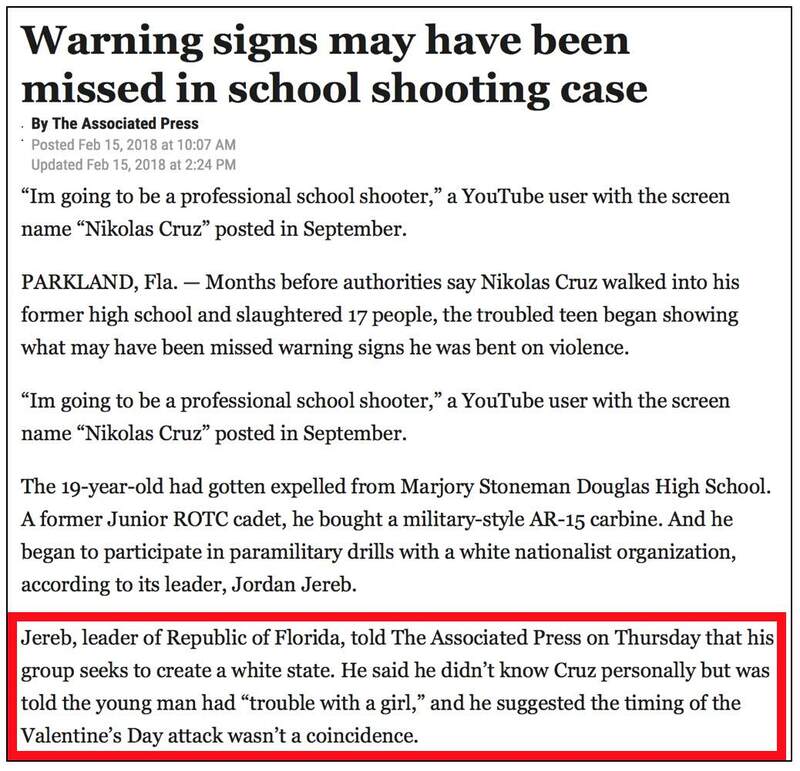 Early Thursday afternoon, the Associated Press abandoned skepticism when the leader of a white nationalist group contacted it, claiming, in AP's words, that "Florida school shooting suspect Nikolas Cruz was a member of his group and participated in paramilitary drills in Tallahassee." Subsequent AP reports downplayed or ignored both law enforcement's assertions of "no known ties" between Cruz and the Republic of Florida and ROF leader Jordan Jereb's bizarre reported walkback. By Friday afternoon, reporters at several media outlets, including Shawn Musgrave at Politico, declared that Jereb and others had "fooled the media" thanks to a "coordinated efforts by internet trolls." 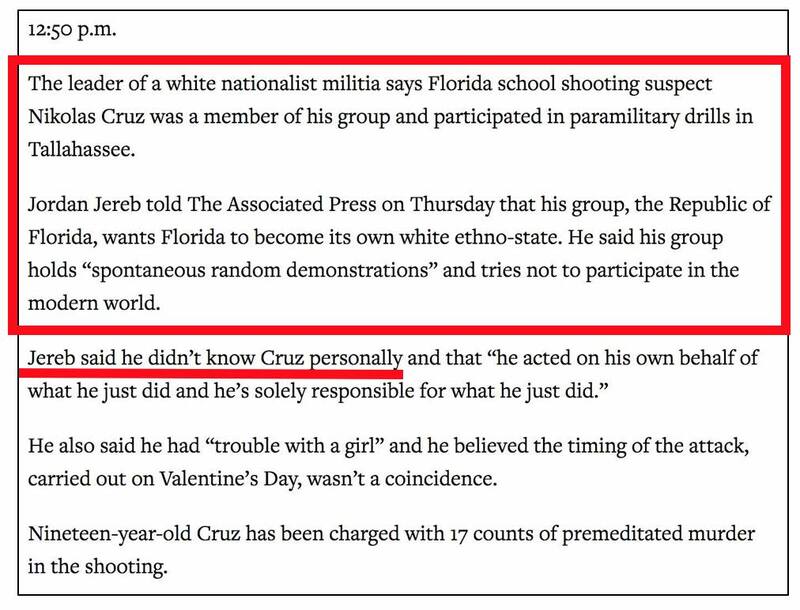 A white nationalist appears to have lied to The Associated Press and other news organizations when he claimed that Florida school-shooting suspect Nikolas Cruz was a member of his obscure group. How could all of this have happened? The AP's Friday evening writeup goes to great excuse-making lengths to explain it, but it's reasonable to ask if what supposedly fooled them was really narrative-fitting information that was too convenient to conscientiously check. As AP's sole source, Jordan Jereb didn't "confirm" anything. 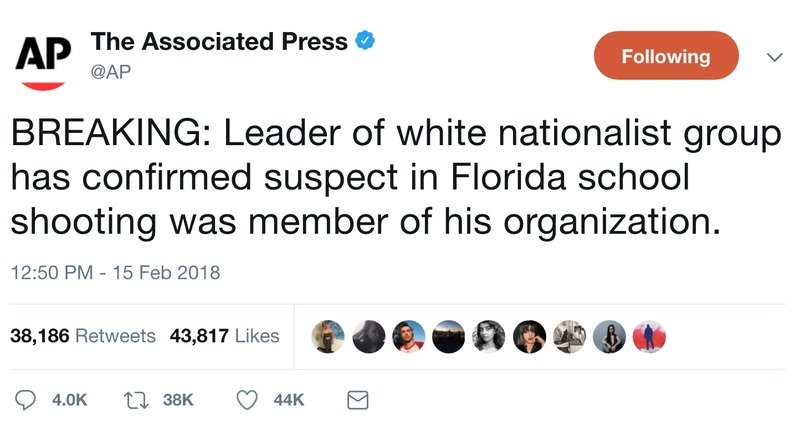 Nine minutes later, AP tweeted a de facto correction claiming that "The leader of a white nationalist militia says" Cruz was a member. As of 6:30 Friday morning, the original tweet falsely claiming "confirmed" information had 5 times as many retweets as the second. 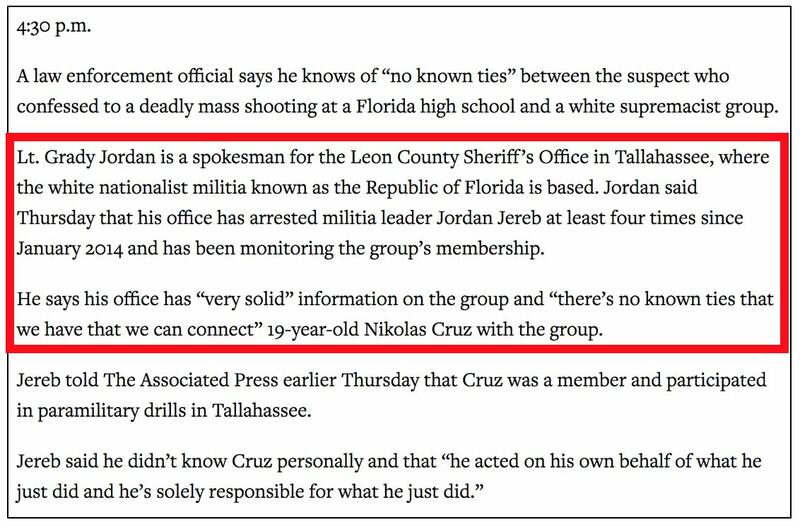 Time.com: "Accused Parkland Shooter Nikolas Cruz Was a Member of White Supremacist Group"
OC Register: "Florida school shooting suspect belonged to white nationalist group"
Sydney Morning Herald (Australia): "Florida shooter Nikolas Cruz a white nationalist member"
A Google News search on "Cruz Florida white nationalist" (not in quotes) at 4 a.m. ET on Friday showed that several other outlets had similarly certain headlines. Many of the articles at the linked websites have since been revised to reflect subsequent AP updates. That the false air of certainty over Cruz's ties remained prevalent for so long is largely due to how the AP buried contrary information deep in one of its subsequent longer dispatches while deleting any reference to it without recognizing its erroneous original reporting in another. There were no references whatsoever to white nationalism in a 1:17 a.m. ET Friday dispatch (also saved here) — only a lame statement that "Authorities have not described any specific motive." ... to take the word of a self-promoting yahoo playing at soldier and militia "leader" without making a minimal effort to confirm the facts is truly beyond belief. It's fair to ask whether AP and other media outlets unskeptically reported what they did because they wanted to believe it. It's also fair to ask, despite the walkback on a low-attention Friday evening, if they're secretly pleased that many people will continue to believe their original false reporting. An earlier version of this post is at BizzyBlog.com.